The Wat Pho or the Temple of the Reclining Buddha is located in Phra Nakhon district in Bangkok. The site, before it became a temple, was a place for learning traditional Thai medicine, including massage therapy. Stone sculptures in yoga positions were made and displayed in the property. It was the country’s first ever university and it also later became known as the birthplace of Thai’s traditional massage. 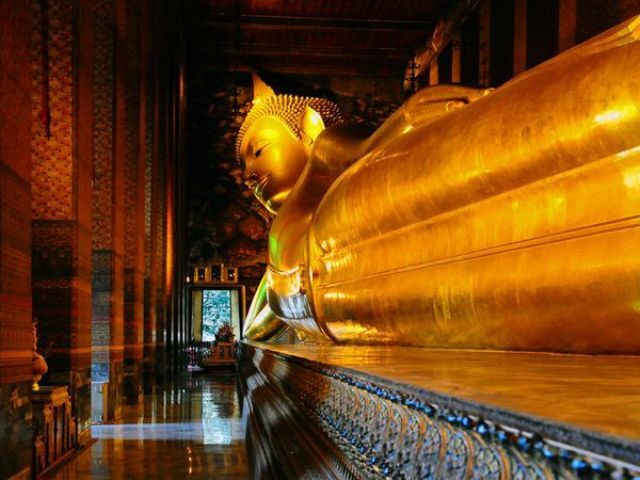 Nowadays, the Wat Pho houses the enormous Reclining Buddha and more than a thousand Buddha images. It is the largest temple in Bangkok with an area stretching over 80,000 square meters. It is also one of the oldest, dating as far back as the reigning period of King Rama I, two centuries before Bangkok became Thailand’s capital city. Also, the reclining Buddha is one of the largest in Thailand. It is 15 meters high and 46 meters long. It is plated gold and, as its name suggests, reclines on its right side. The eyes and the soles of its feet are decorated with mother-of-pearl stones. The intricate carvings in its soles are said to depict the108 qualities of a true Buddha. The Reclining Buddha receives the most attention in the whole complex but an entrance and a visit to the other Buddha in the complex are also allowed. Further, the Wat Pho’s attractions don’t just include Buddha. In fact, next to the Reclining Buddha is a garden with a tree cut from the original Bodhi tree in India where Buddha sat while waiting for Nirvana. This garden is also open to the public. Being the center of traditional Thai massage, it is also possible to get some massage while visiting the temple. There are even various kinds of massage that you can choose from. Aside from this, short courses on traditional Thai massage are also being offered with a focus on holistic medicine. It is not very famous among tourists, but across the North compound is the South compound called Tukgawee, a Buddhist monastery with living monks in residence. This side of the property is also available to the public and you might also enjoy a stroll in this section of the compound. If you’re going to visit the Temple of the Reclining Buddha, be sure to wear clothes that Thais consider as appropriate for visiting holy temples and shrines. This shows that you respect them, their Buddhist culture and their beliefs. Expect to be denied entrance if you’re not wearing proper clothes. You will be asked to take your shoes off at the entrance of the temple containing the Reclining Buddha. A pair of sandals that can easily be slipped on and off is perfect for this occasion. The temple is open from 8:00 am to 5:00 pm every day, with a one-hour lunch break from noon to 1:00 pm. Entrance is by the Chetuphon Road. There is a minimal entrance fee collected and donations are also encouraged. The Wat Pho is definitely one of the must-see temples in Bangkok. The immensely big reclining Buddha will leave a lasting and memorable impression on you of the Thais’ religious beliefs as well as their rich Buddhist history.